International Space Station Expedition 25 crew commadner Doug Wheelock (right) and Flight Engineer Scott Kelly hold the Congressional Medal of Honor that was awarded to Sgt. Lester R. Stone Jr. during a Nov. 10, 2010 video recorded in honor of Veteran's Day. 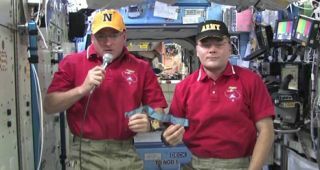 WhileAmericans remember the sacrifices of U.S. service members this Veterans Day,astronauts on the International Space Station are doing the same while honoringone fallen soldier with the ultimate high-flying salute. NASAastronauts Douglas Wheelock and flight engineer Scott Kelly have beamed amessage from the International Space Station to honor VeteransDay in the United States. "We are carrying it as a tribute to allof those who have served and all of those who love freedom," Wheelock saidin a video message. "We wanted to say a huge thank you to our veterans fromouter space, from the crew of the International Space Station." Wheelock haslived aboard the space station in June and is due to return to Earth later thismonth. Wheelock and Stone were both born in Binghamton, N.Y., and the astronautplans to returnStone's Medal of Honor to his mother, Doris Stone, after completing hisspace mission. "Wewanted to send a huge thank you to our veterans of all services around theglobe," Wheelock said. "We wanted to let you know how much weappreciate your sacrifice and your years of service for both your countrymen,your families and for people that you'll never even have a chance tomeet." WhenWheelock returns to Earth, Kelly will take command of the space station. Hearrived at the orbiting lab in October and is flying his own 5 1/2-monthmission. "We make a lot of sacrifices living onboard the InternationalSpace Station for months on end," Kelly said in the Veterans Day message. "But those sacrifices pale in comparison to the sacrifices men and women aroundthe globe from all of our armed services have made in this last ten yearsspecifically, but even more so during the entire history of our country." Wheelock andKelly are two of six crewmembers currently living aboard the InternationalSpace Station. The orbiting laboratory is home to three Americans and threeRussians. Wheelockwill return to Earth on Nov. 29 with two crewmates, NASA astronaut ShannonWalker and cosmonaut Fyodor Yurchikhin. Kelly and his crew will remain aboardand expect to be joined by three new crewmates in mid-December. Why Does Veterans Day Fall on Nov. 11?